The Kenyan parliament has passed a controversial amendment to the country’s election laws, ruling if one candidate withdraws from a repeat presidential vote the other candidate would win automatically. The move has been heavily criticised by the country's opposition group, which boycotted the vote on the amendment. 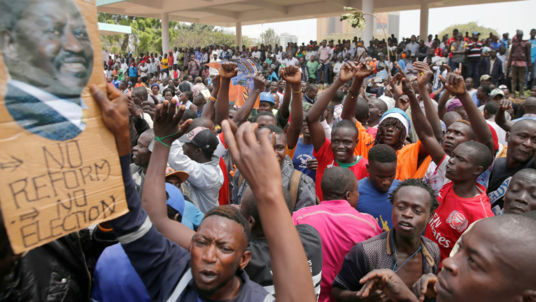 It has also sparked unrest on the streets of the capital Nairobi, with reports of Kenyan police firing tear gas to disperse opposition protesters demanding election reforms. It comes after opposition leader Raila Odinga, of the National Super Alliance (NASA), withdrew from a re-run of the presidential election, which is due to take place on 26 October. He cited concerns over fairness and transparency of the upcoming vote as he pulled out of the race on Tuesday. The politician renewed calls for a new electoral board to replace the Independent Electoral and Boundaries Commission (IEBC). The new legislation must now be signed by President Uhuru Kenyatta, who may still have a challenger in the election re-run - Ekuru Aukot, who polled less than 1% the first time around. The amendment comes as Kenya's High Court ruled that the candidate in August's presidential election could contest this month's re-run, adding to the political crisis unfolding in the country.